Former Presidents George H.W. 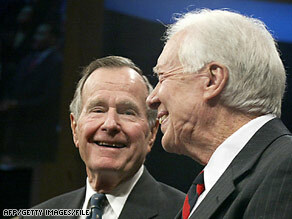 Bush, left, and Jimmy Carter can smile now about their performance in polls. (CNN) - A new national poll appears to validate the adage that time heals all wounds, at least when it comes to two former presidents of the United States. Sixty percent of Americans questioned in a CNN-Opinion Research Corp. survey released Wednesday morning say they approve of how George H.W. Bush handled his job as president, and 64 percent give a thumbs up to former President Carter. Those numbers are about double the approval ratings each had when he was voted out of office after one term. "Time has been kind to the former presidents," said Keating Holland, CNN's polling director. "Carter's approval rating was just 31 percent on the eve of the 1980 election, and was at 34 percent in late December of that year, the last measure taken during his presidency. But now 64 percent approve of how Carter handled his job as president." See, a GOOD LEADER (Obama) seeks advice and consults with the only men that can give him REAL advice. Men that have served in the same position. Sure, Obama will ask personal questions about handling the media, foreign affairs and raising kids in the White House. Its nothing like getting advice on how to handle the job from people who have held the job. Any good military commander that takes over a new job will tell you to FIRST, observe, get a feel for the job...then start to impliment your changes. I'm sure Obama will be a "student" listening to these former presidents. EACH former pres. can give Obama candid advice on the office, the pros and cons, public opinion, and how THEY felt while serving. Obama will take off of this valuable information, talk with HIS staff, and move forward. Only good leaders know how to listen and learn from others. TYPICAL OF PEOPLE TO NOT KNOW THEIR HISTORY…….CARTER INHERITED A DISASTER FROM NIXON & FORD! We had just ended ANOTHER illegal war VIETNAM, spending billions there as well! HOW EASY it is to blame Carter, when in FACT, Nixon & Ford were the REAL DISASTERS! HISTORY IS REPEATING ITSELF WITH GEORGE W. BUSH………BARACK OBAMA IS INHERITING A ……….DISASTER…… WILL THE FAR-RIGHT-NUTS THEN BLAME OBAMA IN 4 YEARS……… YOU PEOPLE HAVE SELECTIVE MEMORY!